Code of Silence—the debut middle grade novel from speaker and devotional author Timothy Shoemaker—has a familiar premise, most recently seen last summer in the blockbuster Super 8: friends forced to keep a traumatic event they witnessed a secret. In this case, the secret doesn’t involve a train car with a mysterious creature inside, but the consequences are nonetheless dramatic. In the novel’s first pages, middle school-aged friends Cooper, Hiro, and Gordy witness an armed robbery at their favorite burger joint and are appropriately scared out of their wits. The novel’s title refers to the pact the three make to keep the truth of the incident to themselves, vowing to never tell anyone what they saw. What results is a morality tale about the dangers of lying, and the impact of secrets on friendship. However, Code of Silence is less Crime and Punishment for teens as it is a compelling psychological study of the weight of secrets on an individual’s consciousness. The primary focus of the narrative is Cooper. Following the harrowing escape from the restaurant—named Frank n’ Stein’s after the two owners— he realizes he’s left some key pieces of evidence behind, and all three friends are visible on the store surveillance footage. They also suspect if the group is identified, the three perpetrators of the crime will come after them to tie up loose ends. So, they take the titular Code of Silence, hoping if it works properly, the bad guys will be caught and the trio’s presence at the crime scene will get swept under the rug. For the purposes of narrative tension, and thematic impact, that—of course—doesn’t happen. The plot gets complicated when the cops begin sniffing around the trio’s middle school. While the group began the story with a singular will, cracks begin to show in the friendship as the net around them tightens, and ultimately, Cooper is left alone to discover who’s behind the crime so he can escape any ties to it. What works in Code is the systematic recapping of the psychological effects of the secret on both the individual teenagers and the friendship of the group. Shoemaker effectively outlines for young readers a plausible descent into mistrust and the collateral damage rendered by guilty consciences, even though the group hasn’t really done anything wrong. Their decision to keep their information to themselves eats away at them, and while it’s not recapped in an overly dramatic way, it is accurate. Although much of the novel isn’t thrilling in a way that most middle grade thrillers are, the novel’s final scene—a confrontation between Cooper and the bad guys in the freezer of Frank n’ Stein’s restaurant—is harrowing and adrenaline-packed. 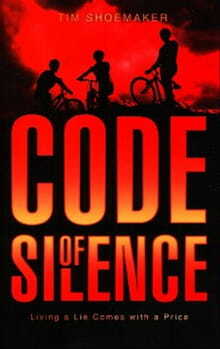 The overall impact of Code of Silence is lessened due to Shoemaker’s unrefined narrative instincts. His unfortunate choice to use a third person narration keeps us at a distance from Cooper, which really cuts back on our connection to him as a character, and his authentic experience of guilt. Likewise, his two friends Gordy and Hiro are rendered in a rather nondescript manner, making it difficult to get attached to either of them. The other major drawback here is the repetition of the “lies are bad” mantra repeated throughout the novel. One wishes Shoemaker had allowed room through the events of the story for the reader to come to this conclusion individually, as opposed to simply telling us this.